Overlooking the village green and cricket pitch this delightful mid Victorian country house offers substantial accommodation that retains many of its original character features. Set in the heart of the community the property was once the hub of the village being originally The Cuckoo public house. We understand the the property was de-licensed and turned into a private residence in 1956 and subsequently extended and refurbished in 1989. The accommodation comprises reception hall, dining room, cloakroom, sitting room, drawing room, kitchen/breakfast room, utility room, barn/potential annexe and to the first floor master bedroom suite with dressing room and en suite bathroom, three further bedrooms and family bathroom. To the outside there are a number of outbuildings totalling approximately1,000 sq ft for storage as well as the potential to convert into offices / self contained annexe if so required, together with a large private courtyard that provides parking for a number of vehicles. Sandon: - Sandon is a most delightful village that has a vibrant community with many local activities arrange around the green and cricket club. There is a village hall that holds many events including pub night, film nights and coffee mornings as well as a highly regarded primary school. Although enjoying a beautiful setting the property is within a comfortable driving distance of major towns including Royston, Baldock, Letchworth and Buntingford the majority of which provide excellent rail services into Kings Cross and London ( Buntingford exempt) as well as their respective leisure, sporting and shopping facilities. Entrance Hall: - Marble white and black tiled flooring, turning stairs to first floor with cupboard below, sash window to rear aspect, dado rail, coving and ceiling rose, doors to dining room and cloakroom, glazed multi panel double doors to sitting room. Cloakroom: - 10'4 x 7'2 (3.15m x 2.18m) - Frosted window to rear aspect, fitted with a white suite comprising close coupled wc, inset wash hand basin to pine vanity unit with tiled inserts, stone flooring, coving to ceiling. Dining Room: - 14'9 x 11'6 plus bay (4.50m x 3.51m plus bay) - Sash bay window to front aspect, stone flooring, cast iron open fireplace with tiled inserts and hearth, dado rail, coving to ceiling, exposed beam. Drawing Room: - 20'7 x 15'1 (6.27m x 4.60m) - A bright triple aspect room with sash bay window to front and side, two pairs of glazed multi panel French doors to side and rear aspect, open fireplace with marble hearth, wood flooring, picture rail, dado rail, two wall lights and two picture lights. Kitchen/Breakfast Room: - 19'8 x 13'2 (5.99m x 4.01m) - Fitted with a comprehensive range of oak wall and base storage units with oak trimmed work surfaces incorporating and and a half bowl acrylic sink unit with mixer tap, oil fired Aga, double oven, dishwasher and fridge. Three sash windows overlooking the courtyard and rear garden, stable door to courtyard and multi panel French windows to rear garden, tiled flooring, spotlight tracks. Utility Room: - 12'9 x 10'9 (3.89m x 3.28m) - With pitched beamed ceiling, fitted with a base unit incorporating an inset hob, plumbing for washing machine, cupboard housing oil fired central heating boiler, part glazed door to garden. Barn/Potential Annexe: - 20'9 x 13'0 (6.32m x 3.96m) - Pitched ceiling with exposed beams, exposed stud work, two windows to side aspect, part glazed door to courtyard. En Suite Bathroom: - Fitted with a white suite comprising panel enclosed bath, pedestal wash hand basin, wc, shaver point, sash window to rear aspect. Bedroom Two: - 16'6 x 9'9 (5.03m x 2.97m) - Two sash windows to front aspect overlooking the village green, cast iron fireplace. Bedroom Three: - 13'4 x 13'1 (4.06m x 3.99m) - Sash window to front aspect, cast iron fireplace. Bedroom Four: - 10'4 x 8'10 (3.15m x 2.69m) - Sash window to rear aspect. Bathroom: - Fitted with a white suite comprising freestanding bath with claw foot, wc, pedestal wash hand basin, shower cubicle. Double Garage: - 24'0 x 15'11 (7.32m x 4.85m) - Of timber construction with two pairs of double doors. Outbuildings: - There is a workshop, two stables and a tack room. Oil tank. Rear Garden: - Beautiful rear gardens laid mainly to lawn and well stocked shaped borders with a variety of flowers and shrubs. Secluded garden by way of natural screening provided by a variety of trees and hedging. Paved patio area and terrace with pergola. Epc: - EPC Rating F.
verification from their surveyor, a relevant contractor or confirmation through their legal representatives. Statements pertaining to tenure are also given in good faith and should be verified by your legal representative. 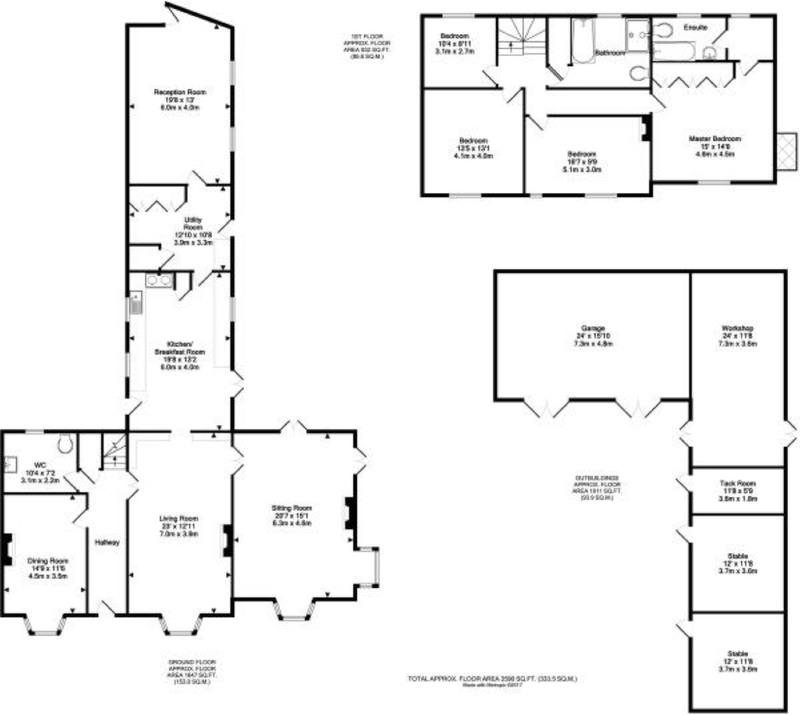 Where provided, floor plans are shown purely as an indication of layout and are not to scale and should not be treated as such. Ensum Brown have been marketing and selling properties in Ware and Hertford for over 30 years. Customer service is at the heart of everything with do, combining this with our three decades of experience and marketing flare enables us to get the very best price for our clients, whilst making the process as hassle and stress free as possible.